Today I'm working with Mains Gas from Flogas to bring you 8 gas safety tips for using gas at home. When I moved into our house about 8 years ago, it was the first time I had ever used gas for cooking, I must admit I felt incredibly intimidated by the lovely range standing in my new kitchen and would do anything to avoid using it at first! Now, some years later, and many family changes I wouldn’t use anything else and absolutely love the flexibility and control that a gas hob can bring you. 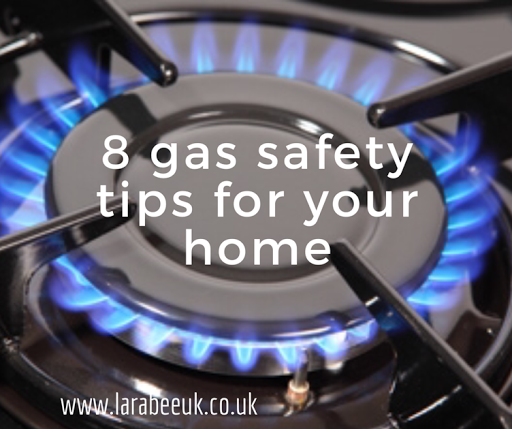 So here are my 8 top safety tips for making sure that your family and home are safe when using gas. 1. Make sure that you have any gas appliances correctly installed by a regulated engineer. 2. Install a carbon monoxide detector, ones with an audible alarm are best and make sure that it’s nice and high as carbon monoxide is lighter than air! 3. Use the correct sized pans for your burners, not only will this be more efficient, it would also be obvious if the gas unexpectedly goes out. 4. This one I hope is obvious, but just in case… make sure that children and pets cannot switch on your gas oven and that children are taught the importance of not touching the cooker. 5. Make sure that you have regular services and gas checks with a trained, regulated engineer. 6. Do not leave gas burners unattended. 7. Be aware if you smell gas in your home, take preventative actions like not turning on a light switch and contact your gas supplier for more advice. 8. Don’t use gas burners to heat your home, not only is this super inefficient, but it’s also really dangerous to leave burners on in this manner.